If you haven’t figured it out yet, I like to read. And I may slightly “cheat” the system. All the books I read aren’t paperbacks, hardcovers, or even via e-Reader… I listen to audiobooks. In the car? I have an audiobook on. Folding laundry? Yep, audiobook is on. We got rid of cable last year and it’s definitely helped with getting through my huge pile of To Be Read books. The Giver by Lois Lowry – ★★★★ – This is a re-read, I remember reading this in elementary school but couldn’t quite recall specifics about the book. I figured since it’s short I’d listen to it before I watched the movie, which I have heard great reviews of. The book is one of my favorites and didn’t disappoint on the second read through. Frog Music by Emma Donoghue – ★★ – Well, considering I didn’t finish this, I can’t recommend it. After reading Room by this same author, I expected another winner. Maybe I expected too much, as this book was a snooze. I just couldn’t be bothered finishing it. Astonish Me by Maggie Shipstead – ★★★ – Good, not great. Joan is a ballerina who was once very famous and had a very public relationship with another dancer. Most of the book focuses on her decline; she become pregnant, settles for a man who has admired her for many years, and the rest of the book follows her child into the dancing world. Honestly, ballet is just not that intriguing to me, and so I couldn’t get super into this. The Oakdale Dinner Club by Kim Moritsugu – ★★★ – Another “good not great”. It seemed like a lot of the details in this book were a little overdone and there were too many characters and relationships or wanna-be relationships to keep track of. The book is about a woman who discovers her husband’s affair and decides to create a dinner club to start an affair of her own. Is Everyone Hanging Out Without Me? (And Other Concerns) by Mindy Kaling – ★★★½ – Okay, let’s be real: this book isn’t going to teach you anything you didn’t already know. It is purely entertainment, humorous, and fun. I read it on the beach in the Bahamas, and I couldn’t have picked a better book. It’s funny, it’s light, and it’s enjoyable. If you’re not a fan of Kaling’s, best to skip this one though. Landline by Rainbow Rowell – ★★★½ – Another light read, Rowell’s latest adult fiction is entertaining, but not revolutionary. Georgie McCool is a TV writer and is super attached to her career. Her husband is sick of it and continues on to the planned family trip back in Omaha. Georgie can’t go because of work. She visits her parent’s house when her old school landline phone transports her back in time to former conversations her and her husband had when they were still dating. A fun premise and I enjoy Rowell’s writing style and books, but I wouldn’t expect to be blown away. Since You’ve Been Gone by Mary Jennifer Payne – ★★★ – This book was honestly incredibly depressing. A single mom takes her daughter and escapes to another city every few months to get away from her husband who is an abuser. He finds them in a new town, and mom goes missing. Not a happy book but unfortunately all too real feeling. I felt like just as the book picked up it was over, so a little disappointing in terms of character development, but this is a new author to the YA genre. Mr. Kiss & Tell (Veronica Mars #2) by Rob Thomas and Jennifer Graham – ★★★★★ – I think I liked the last book better, BUT, this is more Veronica Mars. How could I not like it? And I’ll say it again, if you haven’t watched the show, or seen the movie, or read book #1, you probably should do those things first. They all go in order and you’ll miss out on too much if you haven’t. Dollbaby by Laura Lane McNeal – ★★★★ – I really, really liked this. At first I’ll admit I was kind of bored, but one review compared this to The Help so I had to continue on. I’m really glad I did. This is the coming age of Ibby, a young woman whose father dies unexpectedly and she’s shipped off to live with her eccentric grandmother, Fannie, in the south. Lots of secrets are uncovered about her past, and you easily get wrapped up in the characters. I wouldn’t say this is the next Help, but it is definitely enjoyable. The Girl with the Dragon Tattoo by Stieg Larsson -★★★ – Considering the amount of love this book gets, I feel like I missed something. Perhaps the story was too heavy to listen to on audiobook (I find that happens with some books) or I just wasn’t in the mood for that type of book at the time, but I couldn’t get into it. The book felt slow and heavy, then picks up about halfway through. I think this will have to go in the re-read pile. The Girl You Left Behind by Jojo Moyes – ★★★★★ – If you’ve ever asked for a book recommendation, I probably told you to read Me Before You by the same author. This one is what I’ll be recommending from now on. It was a captivating story, written in two different time periods about two different women, all based around a painting called The Girl You Left Behind. Loved it. The Hitchhiker’s Guide to the Galaxy by Douglas Adams – ★★★★ – It seemed odd that I had never read this, so I finally checked it out from the library. What a completely quirky book. I really had no idea what this was about, and throughout I just kept laughing at the nonsensical-ness of it all. Humorous, entertaining, and quirky… definitely not life-changing, but worth reading at least once. The Alchemist by Paulo Coehlo – ★★★½ – I’ve never read Coehlo before (despite owning a few Kindle books of his… oops) so figured it was time to give The Alchemist a try. I’m glad I did though I can’t say I enjoyed it too terribly much, but it felt like one of those books everyone should try at least once. The Alchemist follows the journey of Santiago from Spain to the Egyptian Desert. Instead of discovering real treasure, he instead finds the “treasure within.” A little cheesy, but definitely a “follow your dreams” inspirational type of ending. 2 A.M. at the Cat’s Pajamas by Marie-Helene Bertino – ★★★ – Eh. This was just okay. Essentially this book all happens in the course of one night, ending at 2 AM at the Cat’s Pajamas. You meet multiple characters throughout, a stars-in-their-eyes singer, a recently divorced teacher, and the club owner who is about to lose the business if she can’t make up the money owed. A little predictable, and honestly, a little hard to follow in book format. I often confused the characters and had a hard time keeping track of who was who. So many books to check out and add to my list! I am wanting to read the sequel to the Rosie Project now! Oh, The Girl with the Dragon Tattoo is one of my favorites! Sad to here that you didn’t love it. The Alchemist is on my to-read list though! I think the format of the reading was definitely the mistake, I hope to re-read it soon! I really need to read thr Hitchhikers Guide to the Galaxy, I never have and I hear its a great read. I’ve actually never done an audiobook but I need to try it because I think I would really enjoy it, especially in the car! I’ve been reading a lot of heavier books lately so I think I need to check out Mindy Kaling’s book, I just want something light and fun! Thanks for sharing! since you’ve been gone really does sound depressing, jeepers. adding dollbaby to my list! Yeah, definitely will re-read The Girl With the Dragon Tattoo in normal book format. Not a good book to listen in audio format at all! Haha, I’m not either, but reading reviews of the book, there definitely are anti-Mindy people! I have quite a few of these on my “to read” list already! I will definitely have to add “The Girl You Left Behind” I’ve heard so many great things about that one and that author. I still have yet to read any of her books! I know, where have I been?! Last month I read “To All the Boys I’ve Loved Before” by Jenny Han and I really liked it a lot. It’s a YA book and a super easy read but I really enjoyed it. I also read Dark Places by Gillian Flynn and it was pretty good/okay. Haha, you definitely need to read that book (or anything else by Jojo Moyes, really) then! Oh I have that one on my list, and I think it was Lauren Conrad’s book club pick too. I’ll have to read it as soon as I finish my reading challenge books this month! Good job! I am trying to get into audiobooks. Do you purchase all your books? I try to rent all mine from the library and just rented an audiobook and it was just an MP3, so now I need to figure out how to get it onto audible so I can bookmark where I left off. Struggles. But I definitely think it’ll help me with my reading challenge. I am already four books behind schedule! Nope! I listen to a lot of them with the Overdrive app on my iPhone, then check out books from my library! If you have the MP3 version, you may be able to download Overdrive, login to your library account, then download the book in the app. It’ll save your spot that way! Oh man, you are doing so well! 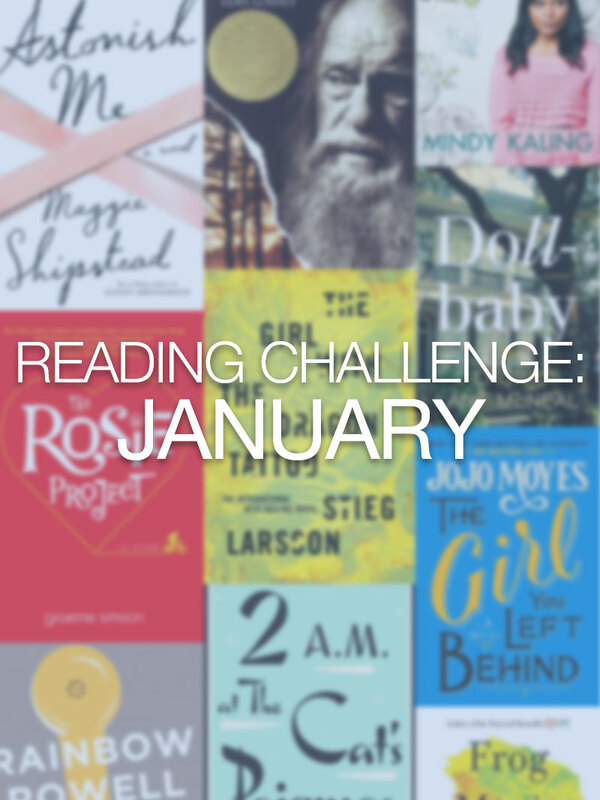 I only got through three books in January, and need to step up my game! Also, if you enjoyed The Giver as a reread, you need to check out the rest of the series (Gathering Blue, Messenger and Son). I read them all a few months ago and was blown away by how well they all connect back to The Giver! Thanks Chelsie! I’m sure you’ll catch up. I definitely need to read the rest of the series. I didn’t even know it was a series until recently! Haha, you’re not! My book club read it a couple of months ago (I’d already read it) and some didn’t like it. That’s alright, everyone likes different things! :) We don’t watch sports, so really, we had no excuse! 15 books in a month, I’m very impressed! Of those I’ve only read The Girl with the Dragon Tattoo and The Giver and I liked both a lot. The Girl with the Dragon Tattoo was heavy and dense but I liked it overall. I was pleased to see a man write about this topic because it’s not a women’s issue, it’s an everyone issue. Thanks Lauren! I agree, it really was refreshing to see this topic covered by a man! You’re right, it is an everyone issue! I can definitely see Dragon Tattoo being way too heavy in audio format…but I did love it in book form. And Mindy Kaling is awesome! It was too heavy for me, so I will defintely re-read in book format. I tend to have a hard time with serious novels in audiobook form! I was waiting forever to read Astonish Me and I finally got it from the library on my iPad and now I’m just feeling iffy about it/having a hard time getting into it. I also have The Girl You Left Behind but I’m weird and am saving it so I have a new Jojo Moyes book to read. And I still haven’t tried an audiobook even though so many people love them! This gives me so many good books to possibly read! I really need to look into audiobooks – I think it will help me get more “read” too. From your review and comments I think The Rosie Project might be a must on my list next! What a great list! I just picked up the audio version of Astonish Me at the library. I was surprised at how much I liked the Girl With the Dragon Tattoo (I read it because I needed a translated book for a reading challenge). I still would like to finish the series, though. That’s the same reason I listened to Girl with the Dragon Tattoo. I think I need to read the actual book to fully absorb the story! That’s a good idea, I wasn’t in love with The Alchemist, it was good but not great IMO! I book on tape too, I listen to the books I am teaching as I drive to work everyday. It helps me keep the info fresh. But I can never find the quotes I want in class. And Mindy Kailing’s book taught me everything. everything! Oh that’s a great idea! I could see that being super useful for teachers! Haha, Mindy Kaling is awesome, her book is so fun. I abandoned Astonish Me about half way through, I just couldn’t get into it either. I was a fairly serious dancer long ago too. Well I’m glad it wasn’t just me then! I thought parts of it were good, but by the end I was happy it was over. You’re not alone. I could never get into Dragon Tattoo. Glad to know I’m not alone! I think I will try it again just to be sure though!